"I wanted to write a novel about Aristotle, not Alexander-- at first, the boy was just along for the ride. In early drafts he was a supporting actor, no more. My real passion, or so I thought, was the philosopher who was his tutor. Here was a subtle, adult mind; a once-in-a-thousand-years genius-- a character of Wagnerian scope. All I knew about the kid was that I wanted him to be annoying." 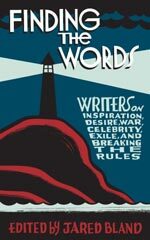 To read "Alexander", my contribution to the brand-new PEN anthology Finding the Words (edited by Jared Bland), please click here. I *loved* your book and wanted to know more about you and your creation. The PEN piece was very interesting. You brought the ancient world to life for me -- thank you! Thanks so much for your kind words, Kristen!